In 1955, Topps produced one of the all-time ultimate football sets - Topps All American Football. The set, which included the greatest college football players of the past and present, featured a classic design and the first cards of many legends. To this day, it continues to be one of the most collected trading card sets in the hobby. 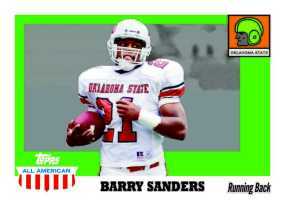 And now, in 2005, Topps is pleased to announce that the Topps All-American set is back! See Barry Sanders as an Oklahoma State Cowboy, Herschel Walker as the dominating running back for Georgia, John Elway of Stanford University, L.T. with the Tar Heels of UNC and a young Joe Montana as quarterback for Notre Dame. Classic college photography fused with one of the greatest trading card designs ever will make for an instant classic. And making this set even more spectacular, 95 players will be signing their cards (2 per box). There will also be autographed refractor parallels and even co-signer cards matching up two collegiate legends. Each 6-card pack of 2005 Topps All-American carries a $5 SRP and each 24-pack box guarantees 2 Autographs and 4 sequentially numbered Chrome Parallels. All-American releases the week of December 5th. Retired football and College legends featured in their college uniforms on the classic 1955 All-American design.